“When the snow’s blowing and your power’s out, that’s when we go to work,” Hinrichs said. Inside Energy has reported on the new technologies that are changing our electric grid, from smart meters to adding solar and wind power generation. But our electricity still travels from the power plant to our homes via miles of power lines. And someone has to keep those lines functioning. That someone is Hinrichs, a lineman for Xcel Energy. Hinrichs has worked as a lineman for 25 years, and storms are the worst time for the job, he said. When branches bring down power lines or motorists slip on wet roads and take out a utility pole, the “trouble men” – the emergency repair crews – get called out to restore the power. Those trouble men are on call whether the storm is in town or in another state. Hinrichs recalled a day that he was out riding his motorcycle with his wife when he got a call about bad weather in Minnesota. A few hours later he was on a plane to repair lines in Minnesota. 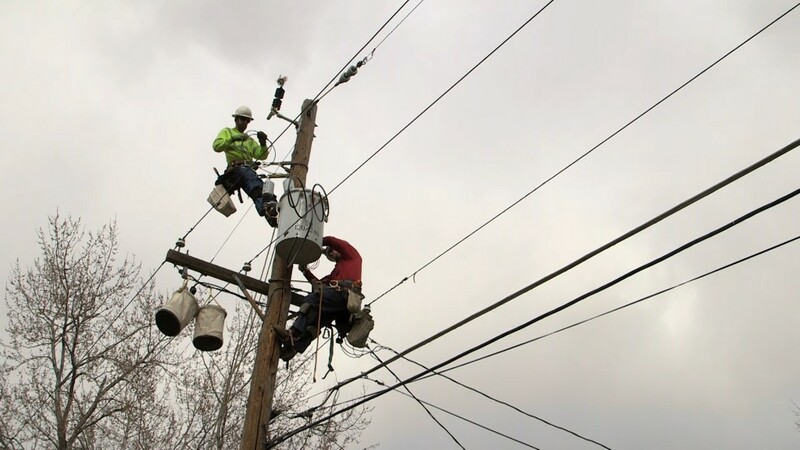 But most of Hinrichs’ work now is maintaining and updating the aging power lines in Denver. When Inside Energy met up with Hinrichs, his team was replacing an old transformer in a customer’s backyard. Hinrichs’ crew scaled a utility pole bearing a date: 1953. And that’s probably about the age of the neighborhood, Hinrichs said. Since 1953, the houses in this neighborhood have added electrical appliances – air conditioners, dishwashers, electric heating, big screen TVs – which strain the old transformers that deliver power to individual houses. Hinrichs said often the utility doesn’t know what needs to be replaced or upgraded until customers call to complain that their power has gone out. Some smart grid technology may keep the utilities and the crew abreast of changes, but ultimately the linemen will still need to go out and fix the problems, Hinrichs said. And that can get dangerous. Hinrichs described days when their crews needed police escorts after gunfire broke out below their trucks. Even routine maintenance, like replacing transformers, has its dangers. The transformers contain oil, which can sometimes be boiling when crews take them down to replace them. As a foreman, Hinrichs worries more about his crew getting hurt than falling off a power pole himself. The risks of the job mean that crew need to watch out for each other, and that forms a strong bond between linemen. 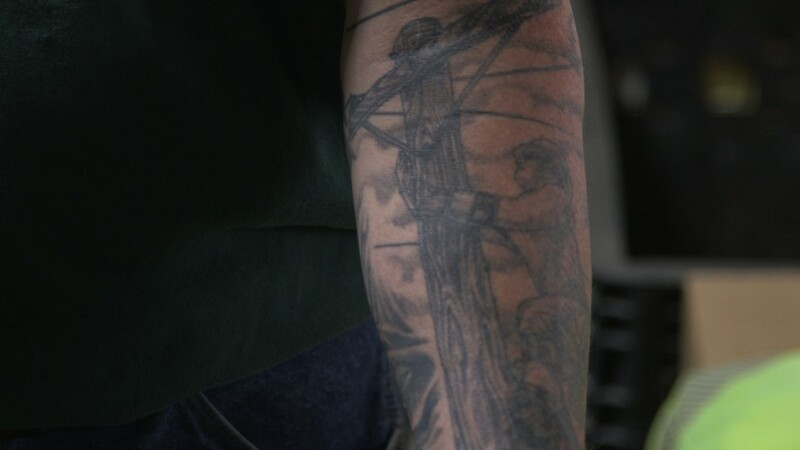 Hinrichs rolled up his sleeve to reveal a tattoo of a lineman working on a pole. When he joined the company more than 20 years ago, he planned to be an engineer, not a lineman. But he fell in love with the work and decided to stay on as a lineman.